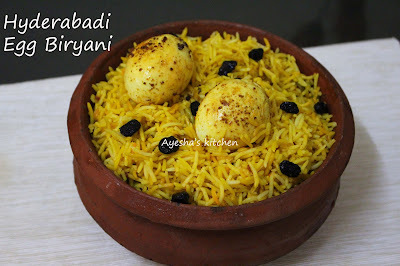 Hi foodies .Today am going to share the best recipe for egg biryani. Hyderabadi biryani is a form of biryani which is considered to be the most flavorful among Indian biryani. 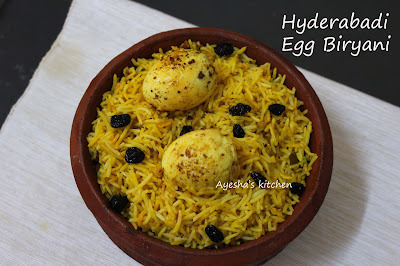 So lets make some hyderabadi egg biryani today. This is one of the easy egg recipe and tastes delicious. Having some delectable biryani after a long restless hours is something(feel)which cant be expressed in words. Yes, the word biryani itself makes me a mood of celebration. I love making biryani when ever am stressed out. It really turns me around. I have made yet another recipe for egg along with this and hoping that i can share soon ...Ok..lets move on to the recipe...Hyderabadi egg biryani is a popular biryani of India which is named after the city Hyderabad. The aroma and flavor of this dish makes a drooling feel. The hard boiled eggs are marinated and tossed in a pan before blending with the rice and gravy. This is the famous and popular one pot meal with hard boiled eggs. Biryani is my favorite weekend special and I have posted some yummy biryani recipes already. Making of biryani is quite simple than ghee rice with gravy. That is the one reason i loves to cook one pot meal. So do try this egg biryani recipe for this week end and enjoy.. Some of my other biryani recipes . Wash and soak the rice in water for half an hour. This makes the rice soft. When done, drain it. Marinate the hard boiled eggs with a paste of red chili powder, pepper powder and salt. Heat a pan with butter and toss the marinated egg until golden. Set aside. Heat a vessel with oil or ghee. Fry the thinly sliced onion until golden and crispy. Transfer it to a plate. To the same oil in the vessel, add the raw spices(cardamom, cloves, cinnamon, bay leaves) and saute for a minute. And then add tomato. Saute until mushy. Now add ginger garlic paste, green chilies and saute until the raw smell vanishes. To this add turmeric powder and salt. Mix well. After a minute, add yogurt, coriander leaves chopped and give a fine stir. Check for salt. When done, add the drained rice and fried onion. Mix to coat well in the masala. Now pour 4.5 cups of hot water to it (quantity of water is taken on the basis of rice taken,,,ie.. 1 cup of rice = 1.5 cups of hot water) . Close the lid and make the flame very low. Cook until all the water dried out. When done, drizzle saffron with milk mixture on the top and let it cool for 5 minutes uncovered. Gently mix the rice and top it with toasted egg, chopped coriander leaves and some roasted nuts , raisins. Drizzle 2 tsp of ghee on the top and let it cook for another 5 minutes in a low flame. 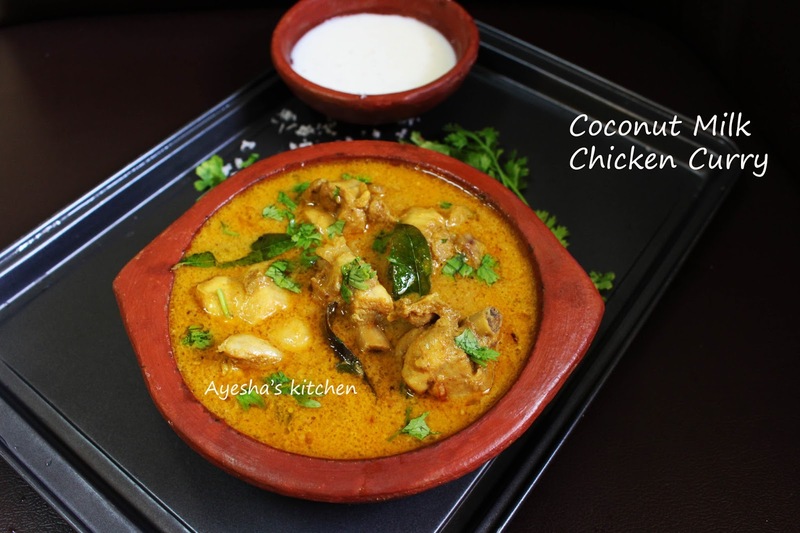 Coconut milk chicken curry is a flavorful chicken curry which goes well with chapathi , paratha, ghee rice and like so. 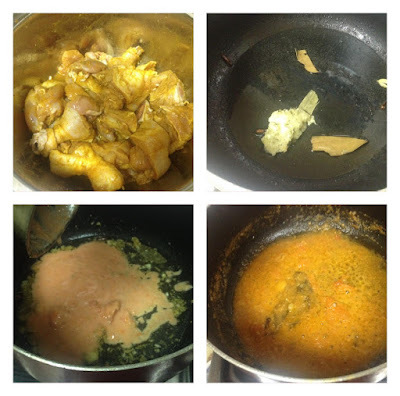 So lets learn today, how to make chicken curry with coconut milk. Chicken curry is mainly prepared in many varieties depending upon country or region. Chicken curry is a common delicacy in South Asia as well as in the Caribbean. A typical South Asian curry consist of chicken stewed in onion tomato gravy flavored with ginger, garlic and other spices. Stewed chicken dish flavored with curry powder is the popular chicken recipe in US. Here am going to make a simple chicken curry which is amazingly flavorful with all that goodness of fresh coconut milk. 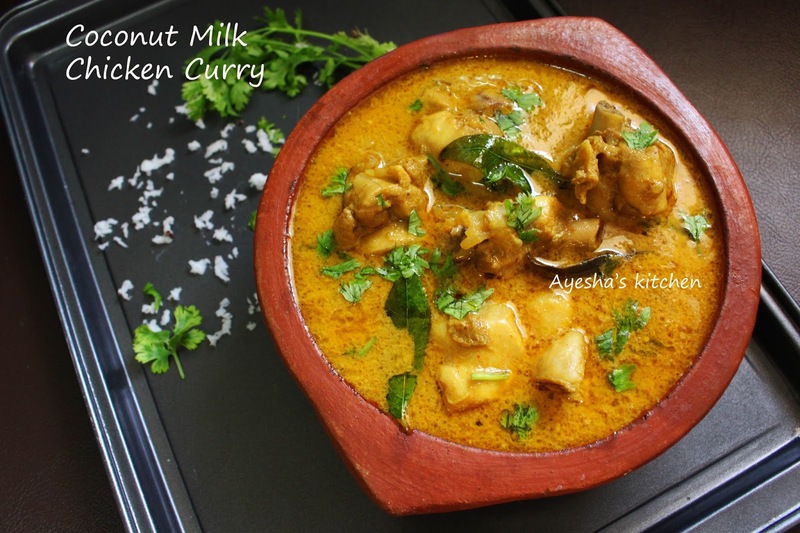 Adding coconut milk to chicken curry adds a special flavor and aroma to the curry / gravy. 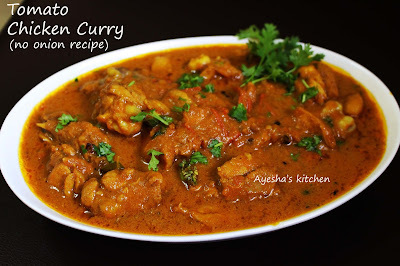 Do try this curry recipe and hope you all will enjoy this flavorful chicken recipe for sure . Marinate the chicken with kashmir chili powder(1 tsp), turmeric powder, coriander powder(half tsp), garam masala powder(half tsp) and salt. Set aside for 15 minutes or until other ingredients gets ready. Now heat a nonstick wok with oil. Toss cinnamon stick, cloves, cardamom, bay leaves for a while and then saute ginger garlic fennel seed paste. Saute until raw smell vanishes in a medium flame. Now add the pureed tomatoes to it, add salt and mix well. Let it cook well . When done, add the marinated chicken pieces, remaining chili powder, coriander powder and cook well in that gravy for 5 minutes. Now add the thin coconut milk to this gravy and allow it to cook until chicken is done, covered. When done, add the fresh thick coconut milk and mix well. When it starts boiling, off the flame. Heat a pan with 2 tsp of oil and toss the chopped shallots , curry leaves until done. Pour it over the curry for seasoning. Pairs best with ghee rice, paratha, chapathi. Today, let me introduce an exotic dish of Middle east. This is one of the recipes which is requested by many readers of my blog. 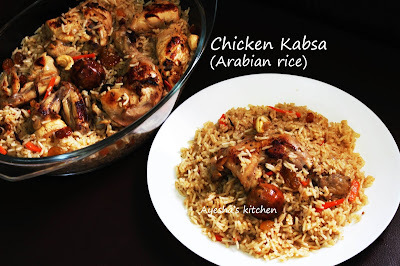 The cooking method of this Arab rice itself is an appetizing one. The best no fail rice recipe for a crowd or a get-together. There are various variations in the preparation of this Arabian rice and am going to share the most common and the simplest method. Even though I tasted this from Arab restaurant for the first time, I enjoyed this aromatic one pot meal more when i prepared it at home. Now I should thank all those readers who made me cook this aromatic and yummy dish more often. 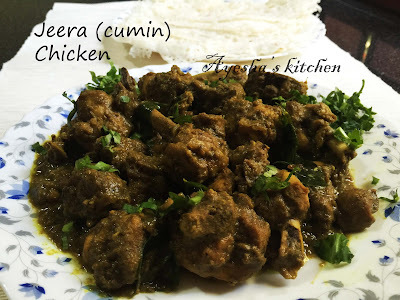 Here the chicken/ beef/ lamb is cooked in the spicy flavorful aromatic gravy and then chicken is separated to toss them in butter, dropping the rice to the gravy instead. The rice will be filled with the flavors of tomato and the kabsa spices. Kabsa is a mixed rice dish which is regarded as a National dish of Saudi Arabia. But it is often served in countries such as Saudi Arabia, Jordan, Qatar, Oman, United Arab Emirates, Iraq, Kuwait, Bahrain and like so. This dish is popularly known as Machboos in Arab countries. Here the meat is cooked in several ways and one of the common and very popular ways of preparing meat is called Mandi. It looks very similar to Indian Biryani too but the use of ghee or butter in kabsa is comparatively less to that of Biryani. 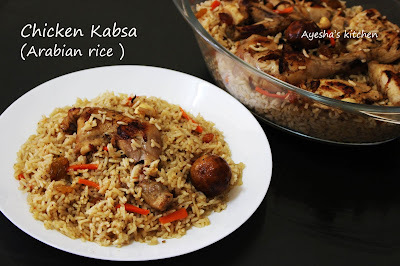 So kabsa is a healthy dish. 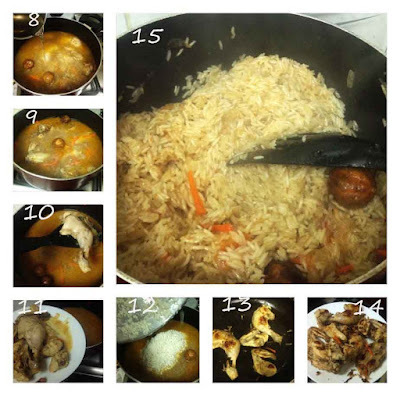 Here is the recipe showing how to make special rice recipe / Flavorful rice recipe / Lunch ideas healthy/quick rice and chicken recipe. Hope you all give it a try. So let's move to the recipe showing how to make chicken kabsa at home. Slice the onion thinly, peel and slice the carrot thinly lengthwise, Chop the tomatoes and make a paste by grinding them in a grinder, Pierce the dried lemon with a sharp knife and make few holes. Keep aside ready. Heat a non-stick vessel with butter or ghee and fry cashews, raisins for 1 minute or until done. When done, transfer it to a bowl. To this, add the sliced onion and saute until transparent. Then add garlic paste and saute until the raw smell disappears. Add dried lemon, 2 tsp of kabsa masala, tomato paste, salt and mix well. Let it cook for 2 minutes. 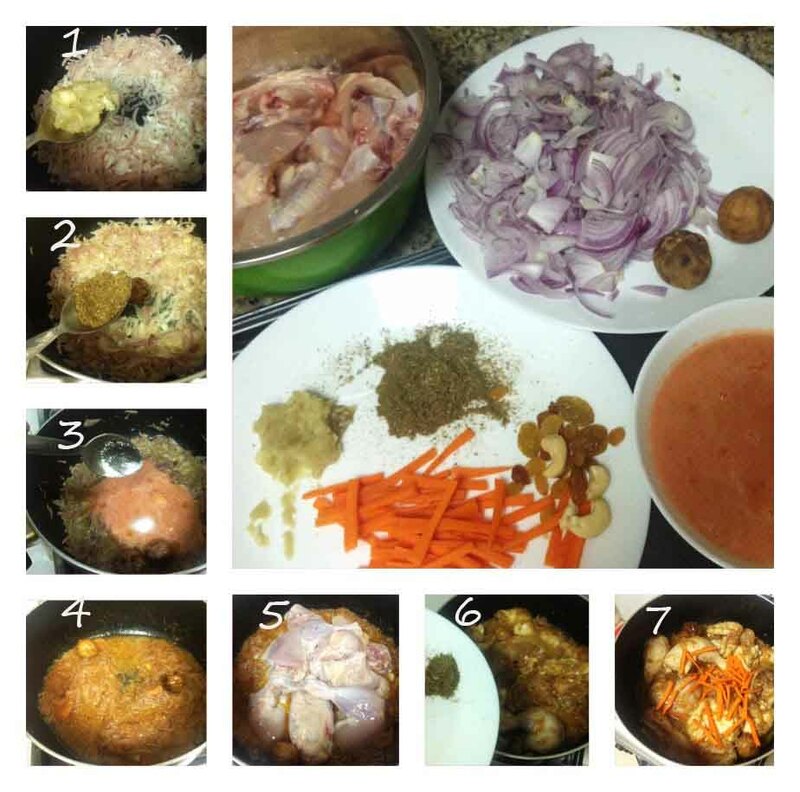 Now add the chicken pieces along with the remaining 2 tsp kabsa masala, sliced carrot and mix well. Let it cook for 5-8 minutes. Then add 5.5 cups of water ( can pour chicken stock also). Cook until chicken is perfectly cooked. When done, transfer the chicken to a plate and add the washed drained basmati rice to it along with some salt (do not add too much salt). Cover and cook until all the water get dried or until the rice is done on a medium flame. Meanwhile, toss the chicken in a tawa or frying pan with a tbsp of butter or can bake in the oven. I spread some pepper powder and salt mixture over the chicken and tossed in the pan(it gives a drooling aroma). When both rice and chicken is done, transfer it to a serving bowl and combine together. Garnish with fried cashews and raisins. Yummy, delicious, aromatic one pot meal ready. Dry roast all these ingredients in a medium flame until a fine aroma comes out and they turn dark in color. When done, remove from flame and bring to room temperature. Then grind to a fine powder in a grinder and can store in an airtight container for later use. Please subscribe to my YOUTUBE CHANNEL - Click here for more cooking videos. Easy dessert recipes with milk or coconut milk are my all time favorite recipes for a crowd or for a get-together parties. I love to make simple desserts but must be very tempting and delicious. 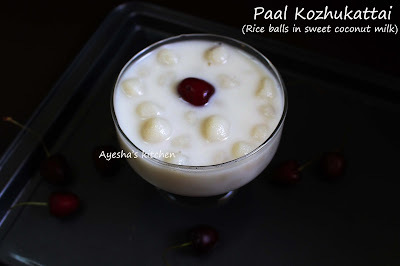 Here am sharing with you a drooling and totally healthy dessert recipe using rice flour and coconut milk. 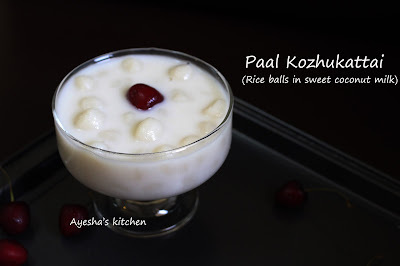 Steamed rice balls in coconut milk / Paal kozhukattai / Thengapaal kozhukatta is a very popular South Indian dessert or sweet dumpling with rice flour. 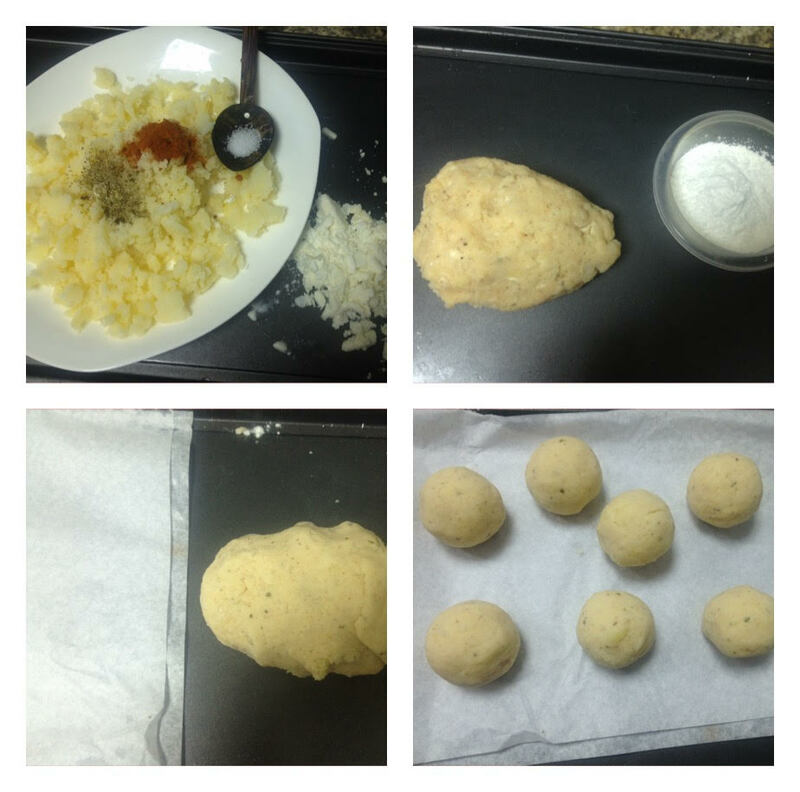 It is very similar to Modak recipe. There are many varieties in kozhukattai like Thennai kozhukattai, Thengapaal kozhukattai, savory kozhukattai, ammini kozhukattai and like so. 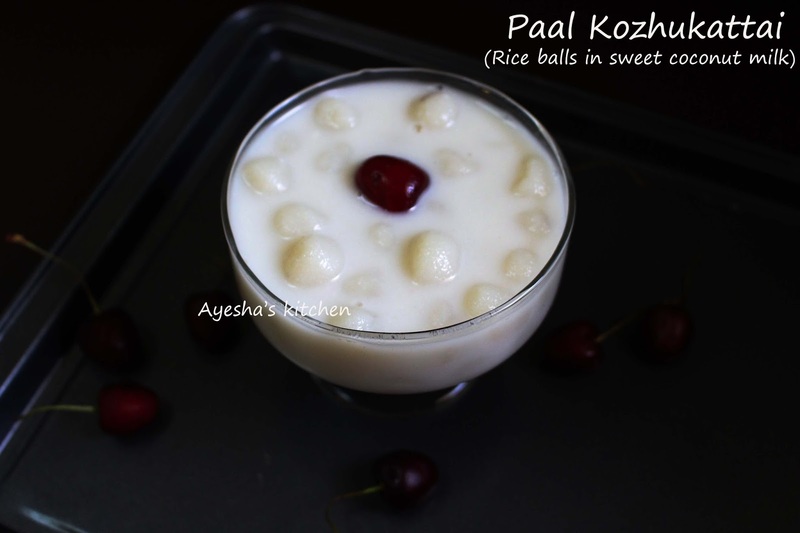 This paal kozhukattai is one of the delicacies that i love to eat on special occasions. This is a never fail recipe for a yummy dessert with coconut milk and I hope all my readers to try this recipe once. Hope you all try this and do let me know how it turned out for you. Take a non stick pan and add milk + water and allow it to boil. When boils, add salt and make the flame medium low. To this add the rice powder slowly, stirring continuously with the other hand. Stir continuously until the water evaporated and forms a dough. (Same like the preparation of Malabar rice pathiri ). Now knead it very well until soft and non sticky(must knead it well when hot and can use little oil to grease your hands). And then make very tiny small balls. Set aside, covered. Now prepare the thick coconut milk and thin coconut milk (for more details...check below notes). Boil thin coconut milk + sugar in a vessel and once boiled, add the tiny balls to it. Cook for 5 minutes or until the ball floats on the top in a medium flame . By now, the coconut milk would have become thicker. Add sugar according to your taste and preference. Combine the thick coconut milk with condensed milk and pour it to this , mix well. Switch off the flame . Do not let it to boil after adding thick coconut milk. Keep refrigerated and serve chill. Thick coconut milk - blend the grated coconut with little warm water in a blender for 1 minute, strain it and take out the thick milk. Thin coconut milk - blend it again with 1 cup of water in a blender for another 1 minutes, strain it and take out the thin milk. Today's dish is cooked in a tomato based gravy without onion. A lovely ,delicious. 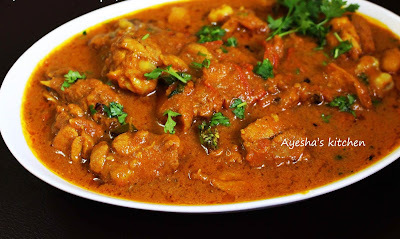 finger licking chicken curry without onion. Its pretty easy to make and tastes really good. 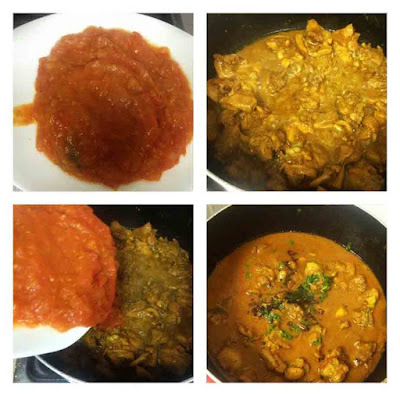 This is yet another simple chicken curry recipe..a spicy Tomato chicken curry ...Is it possible to have a gravy without using onions? 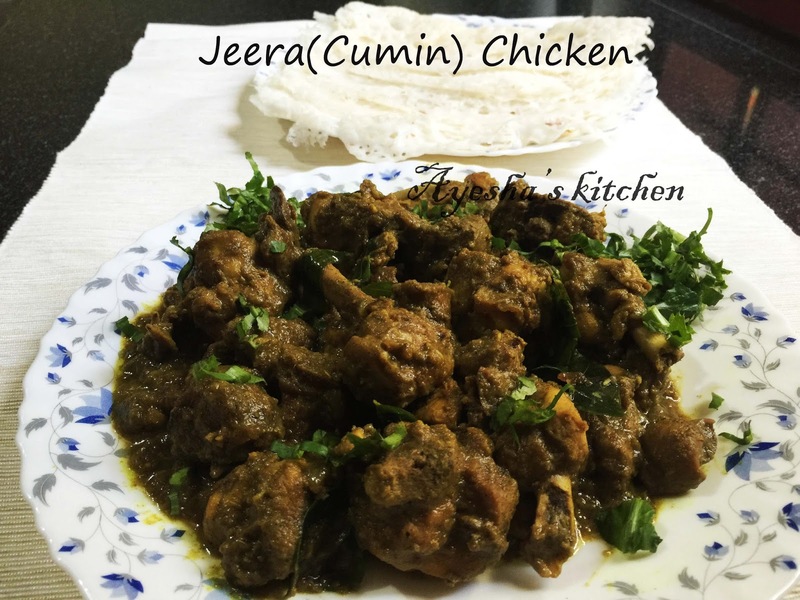 many of my readers asks this question to me when i posted jeera chicken recipe and chicken perett recipe. I have only one single answer. YES..u can make delicious yummy recipes even without onion. I love simple tomato curries and love to experiment with tomatoes. One of my reader requested me to post some No onion No garlic recipes. Some people avoid using onion and garlic in their meals. While some find it difficult to cook without onion and garlic. But trust me...it is the most easiest meal to cook and tastes equally good. Do try out this simple tomato chicken curry . Here is the recipe showing how to cook tomato chicken curry / gravy. Make a fine paste of all those ingredients given under chicken marination in a grinder. Marinate the chicken pieces with this marinade and set aside. Now heat a non stick vessel and add oil. When hot, add the thinly sliced tomatoes to it and saute for a while. Close the lid and let it cook well until mushy or oil separates ( it means the oil must float on the top of the gravy) . When done, add chili powder ,salt and give a fine mix. Transfer it to a plate. Now to the same vessel, add the marinated chicken and let it cook in a medium flame (no need of adding water and oil). When chicken is 90% done, add the prepared tomato gravy and mix well. Let it cook again for 10 minutes or until oil separates. Check for salt and add chopped coriander leaves. Heat oil in a pan, saute chopped shallots until golden and then add curry leaves to it. Pour this tempering over the prepared curry. 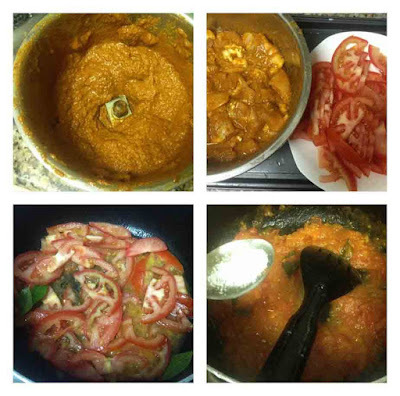 Delicious, quick, no onion tomato curry ready. Serve along with dosa, puri, roti, or any Indian bread. Today i have a delicious spicy snack recipe to share with you. 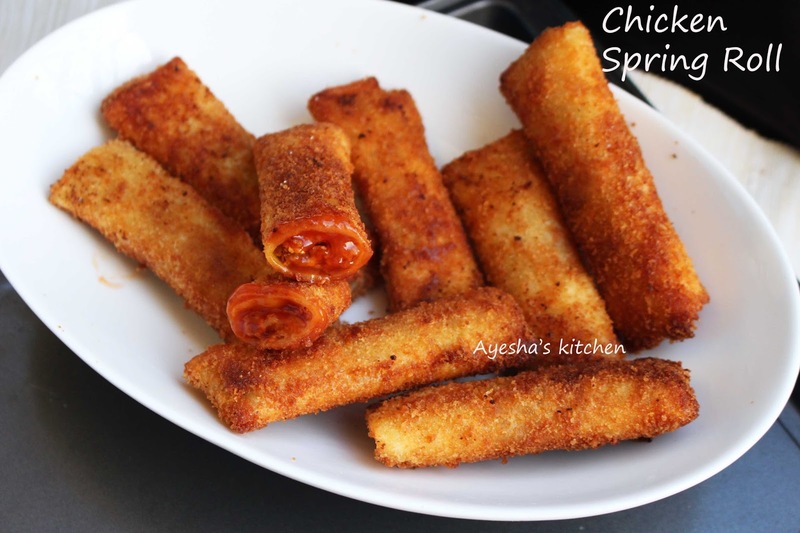 Yet another Spring roll recipe stuffed with shredded chicken and vegetables flavored with soy sauce, breaded and deep fried. Spring roll recipe is actually a Chinese fried food recipe typically contains minced carrot and other vegetables.You can alter the fillings with veggies, meat, prawns of your choice. So do not forget to try this promising evening snack. It is a quick and simple snack for a crowd which can be prepared in advance. Here is the recipe showing how to make chicken spring rolls. Keep the spring roll pastry at room temperature 30 minutes before making. First, let's prepare the shredded chicken. Cook the chicken pieces with turmeric powder, pepper powder and salt along with half cup of water. Then shred the flesh of chicken discarding the bones. Set aside. Heat 2 tsp of oil in a pan and add sliced onion, green chili and salt. Saute until soft on a medium low flame. To this, add garlic paste and saute until the raw smell vanishes. Then add grated carrot, capsicum and saute for few minutes. To this add soy sauce, pepper powder and mix well. Now add shredded chicken and combine very well. Cook on a low flame for 5 minutes, sauteing occasionally. When done, transfer it to a plate. Now prepare the bread crumbs by adding 4 bread slices in blender and powder it. Set aside. 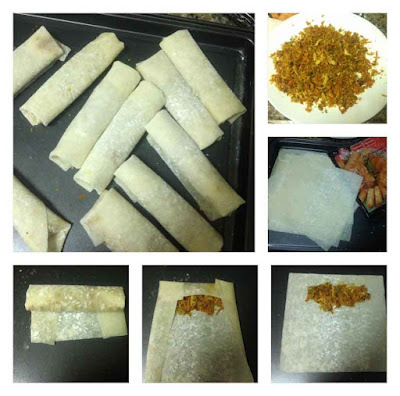 Take a spring roll sheet, add little chicken filling at one end (as shown in the pic), fold it. No need for sealing the ends. 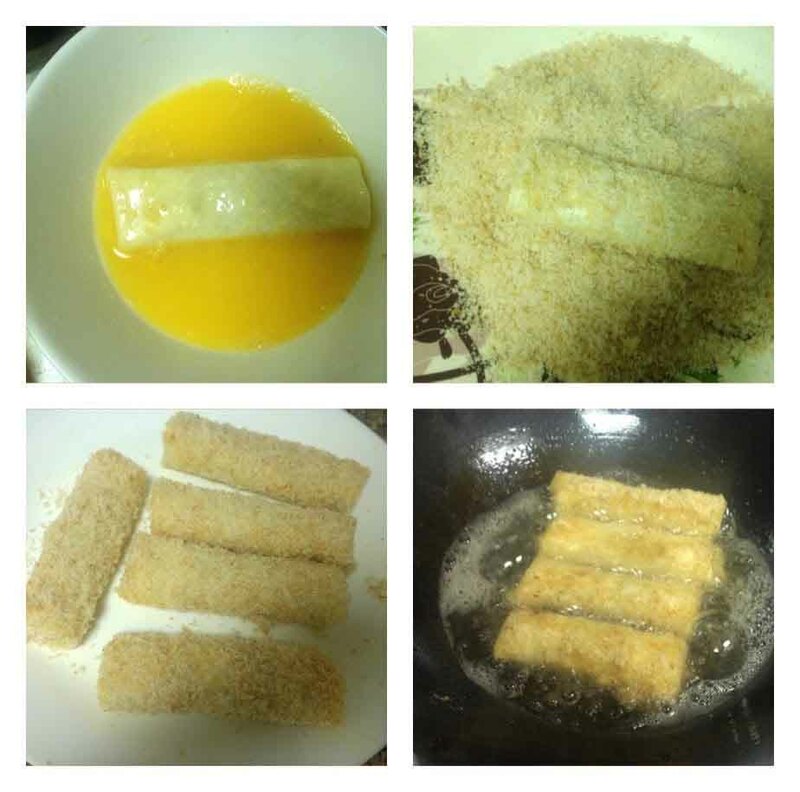 Dip the prepared spring rolls in egg batter and then roll in bread crumbs until well coated. Heat oil in a pan and deep fry the spring rolls until golden on a medium low flame. Are you confused about what to cook for your kids to see their smiling face? 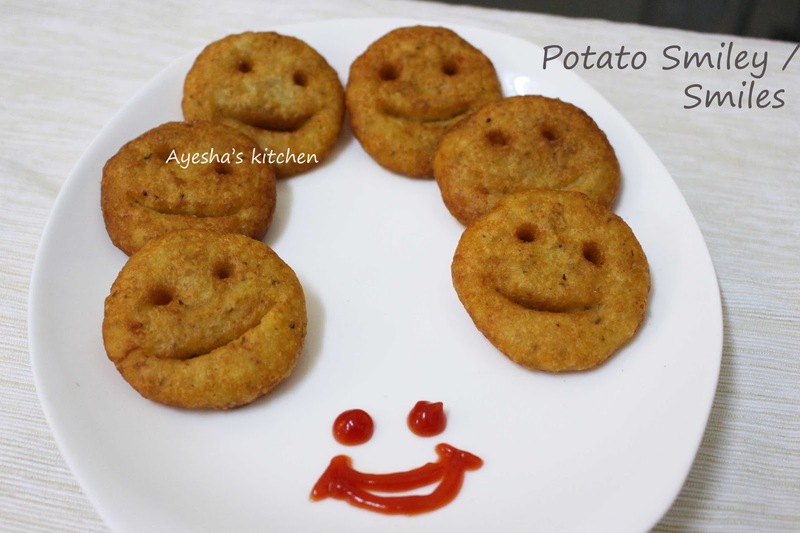 Try out this recipe with mashed potato and enjoy your kid's attractive smile. Food must look fancy and attractive while serving to our naughty lovely kids. isnt't it? 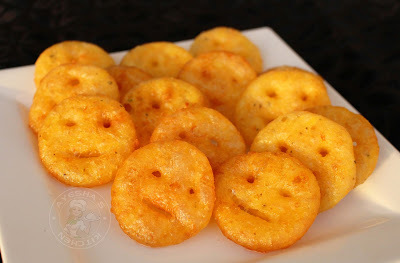 Smileys are happy faces shaped from fluffy mashed potato with cheesy flavor. McCain smileys are very popular around the world. McCain is a Canadian multi national company and they are the world's largest producer of French fries and other oven ready frozen food products like frozen desserts . McCain smiles, wedges, nuggets are delicious and popular with their special seasoning and herbs . 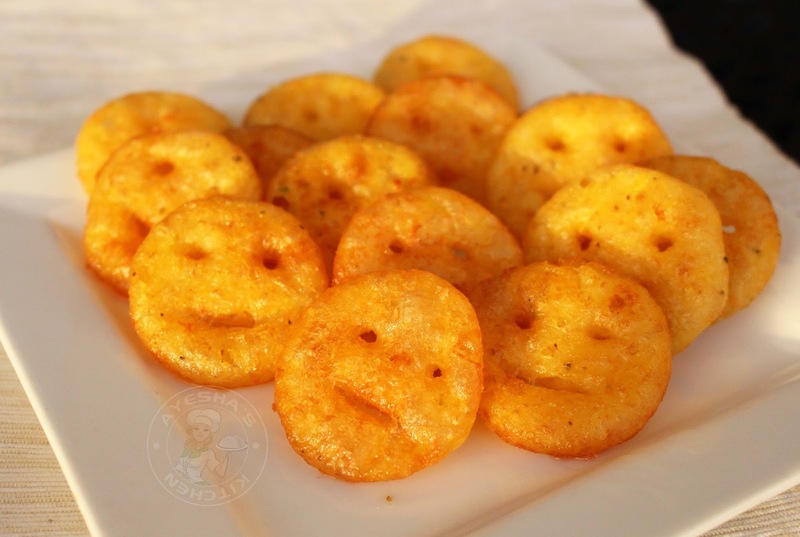 These delicious crispy potato smileys are kids favorite snack. But its not good enough to feed our children frozen products every time. 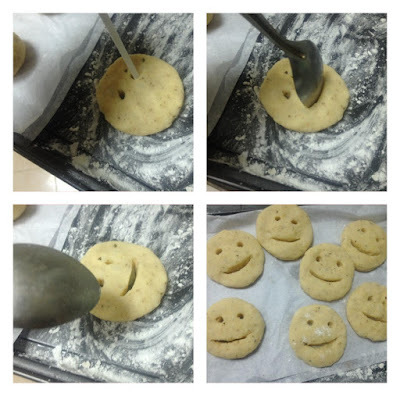 So lets prepare these lovely delicious smileys at home. 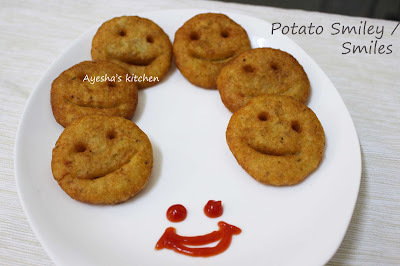 So just follow this super quick recipe and enjoy with your loving young ones. 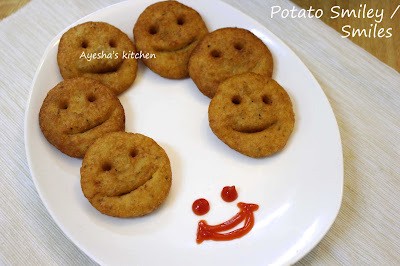 Here is the recipe showing how to make potato smileys at home. Boil the potato with skin and then discard the skin. Grate it and then mash well. Grating before mashing helps to avoid lumps if any. Combine this mashed potato with chili powder, salt, oregano, and cheese. Mix well. Now add the cornflour and shape it into a dough. You can add more cornflour if the dough is more sticky (only if required). Keep it in the refrigerator for half an hour. Now make small balls out of that dough and flatten each ball (must have minimum thickness). Keep it over a butter paper to avoid stickiness. Heat oil and when hot, deep fry these smiles until golden and crispy on a medium flame. Drain it to a tissue and serve hot with ketchup. I am in love with this bachelors special cumin flavored chicken gravy. It pairs best with pancake (dosa) or Indian bread. I dedicate this recipe for all those loving wives whose hubbies work away or abroad... Just parcel this home made spice powder mix along with them , no onion no tomato , simple and humble. The best chicken recipe for bachelors who love cooking yummy food. The fine aroma while cooking jeera chicken reminds me of my school days. 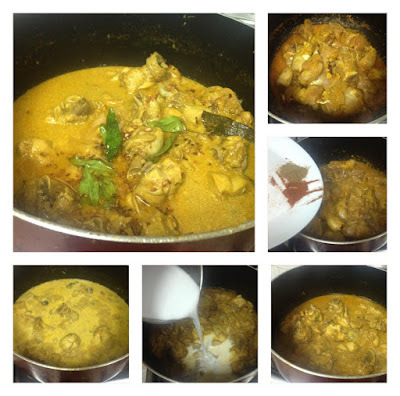 This is my mom's one of the best traditional Kerala recipe. The flavor and aroma of this roasted cumin flavored chicken is simply scrumptious. Roasted chicken is a popular and yummy dish ever. But i hate the use of onion and other ingredients other than spice powders. Hope mot of the house wives hates this process. 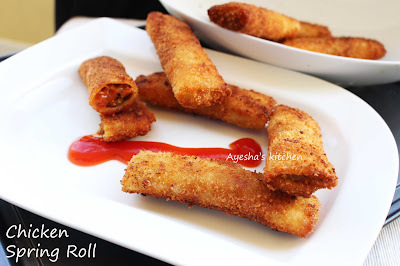 So just try out this recipe once...am sure you will make this dish over and over again. It is quite simple. Just marinate the chicken with few tbsp of this cumin flavored spice mix along with few tsp of curd or lemon , garlic paste(optional) and salt. Cook on a medium flame until thick gravy consistency. Temper it with fried shallots and coriander leaves. Simple and humble..!!!!!. So lets see how to make Jeera chicken or Zeera chicken / cumin flavored chicken recipe. Make a paste of cumin mix masala powder, curd, garlic paste and salt in a grinder. Marinate the chicken with this paste. Keep refrigerated for half an hour for best result. Cook the marinated chicken until done, covered. No need of adding water. When it reaches thick gravy consistency, off the flame. Heat a pan with oil and toss chopped shallots until golden and pour over the gravy. Garnish with chopped coriander leaves. Dry roast all the ingredients (except turmeric powder) in a medium flame until fine aroma comes. Powder it along with turmeric powder. If you are preparing more or less of this masala powder, try to add the spices in this proportion. You can also add garam masala powder (half tsp) along with this . You can prepare this masala powder in bulk and can use instantly. I used to do so. Store in an air tight container.